First Amendment Gallery is excited to announce Imprint, a solo exhibition of linoleum prints by the Oakland-based artist Troy Lovegates. A new direction for the artist, who has previously worked in illustration, painting, and graffiti, Lovegates created the works in Imprint as an exercise in artistic freedom and renewing curiosity. Traditionally, printmaking is a medium that allows maximum reproducibility, a centuries-old technique of recreating something innumerable times. 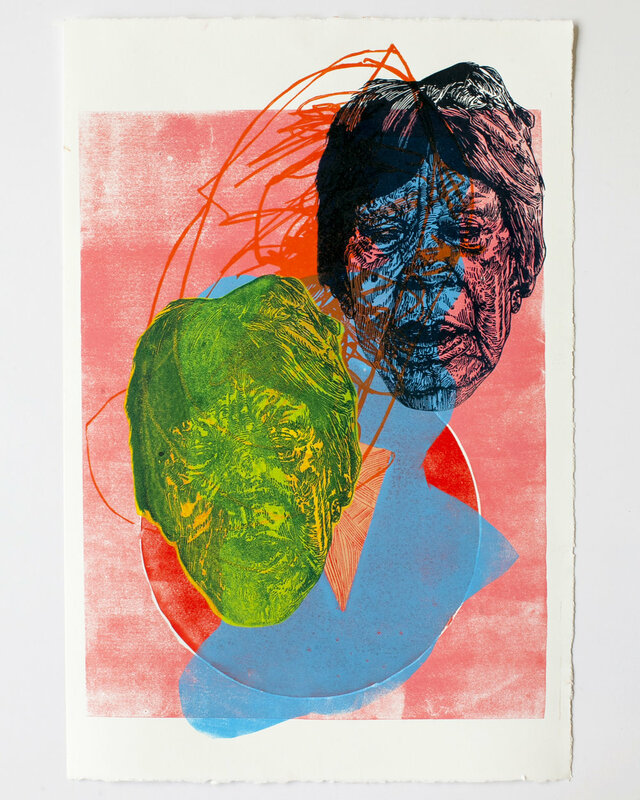 With Imprint, Lovegates seeks to not only expand his own artistic practice but also explore the medium itself by creating variations within his prints, with no two prints looking the same. He integrates both figurative illustrations and more abstract patterns on the linoleum blocks, layering and arranging the images in new ways with each print. Widely known as "OTHER", Troy Lovegates whose heavily patterned are saturated with vibrant color. His knack for found materials and wildly disparate elements, both material and aesthetic, from spray paint, oil stick, water color, acrylic, and ink, to allows him to work on canvas, paper and wooden sculptures. A self-described "collector of lost souls,” and motivated by his own subconscious, the artist focuses on the figure as story, building motifs through heavily condensed mark making. The powerfully weathered figures in his work are sympathetically drawn from equal parts caricature and realistic observation, as they are often real people captured through photographs and physical observation. Imprint opens February 2nd 12-10pm and will be on view through Friday, February 22nd at First Amendment Gallery located at 1000 Howard St. in Downtown San Francisco. Gallery hours are Wednesday to Saturday, 11-6pm. To receive a preview of Imprint contact info@firstamendmentgallery.com.